New Yorkers have perfected the art of looking but not looking. You know, where you let your eyes glaze over someone as you pass, so you can take them in without making it obvious that you're studying them. For this reason I wasn't entirely sure if anyone noticed the giant glowing cat ears on my head as I walked down the street on my way home from work. I certainly noticed them. They were large, somewhat heavy and oh yeah, did I mention they glow? By all rights, as someone who deals with gadgets on a regular basis, I shouldn't want any part of the Axent Wear cat ear headphones. 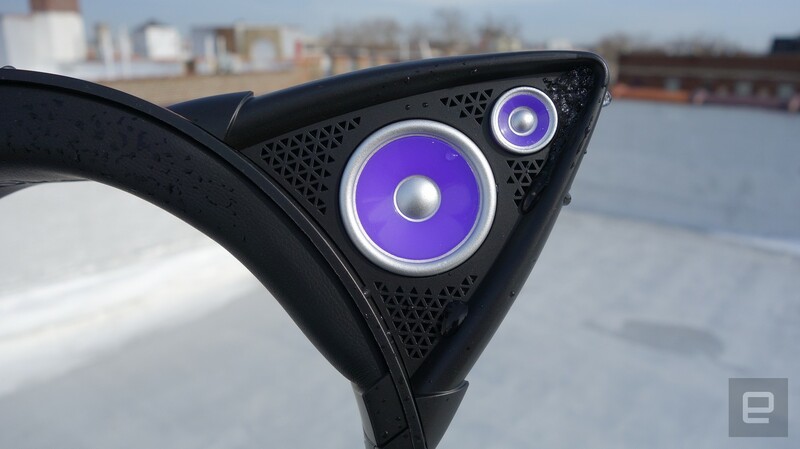 In addition to the steady purple (or green or blue or red) glow, they also have speakers in the ears. They have ears, period. And yet, when I first watched a video of these things in action, something about them tickled the deepest part of my animal brain. I wanted them. I needed them. 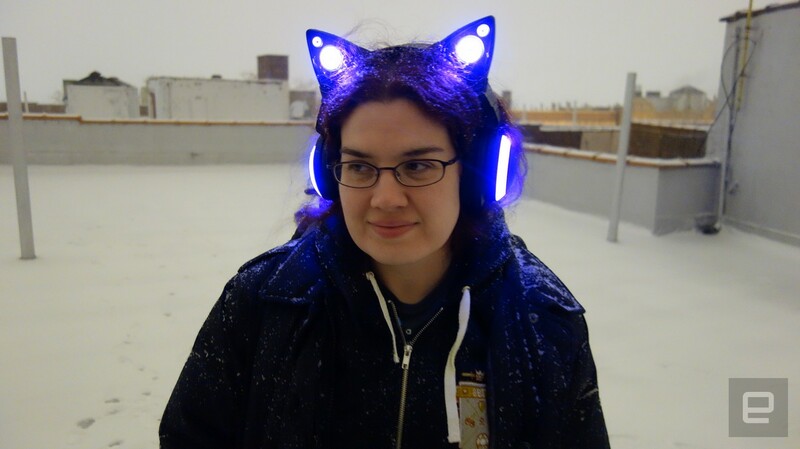 Apparently I wasn't alone in that consuming desire: The cat ear headphones began life as an Indiegogo project back in late 2014, finding more than 20,000 backers and raising more than $3 million. 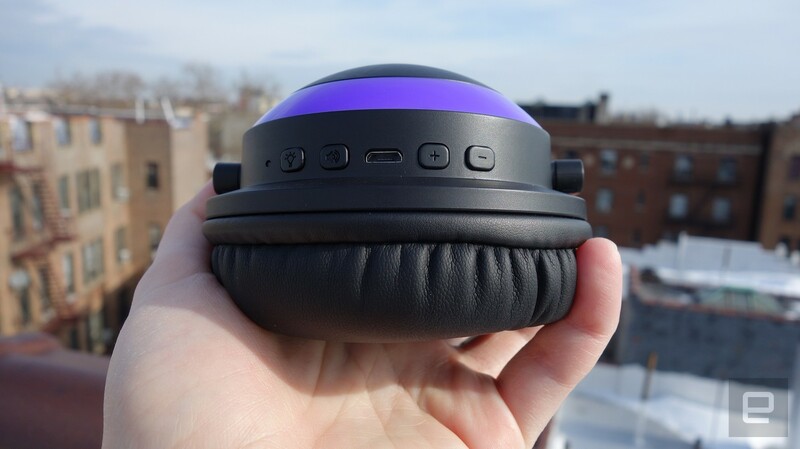 That was enough for Axent Wear to ink a deal with Brookstone to manufacture and sell the headphones, which means you can pop into your local mall and snag a pair to the tune of $130 ($100 online). 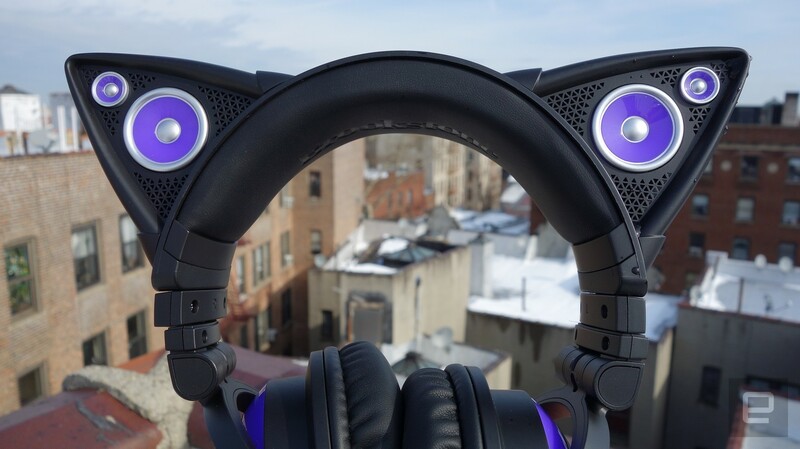 The Indiegogo staff even gave the headphones as company gifts this past holiday season -- not only in celebration of the project's success but as a sign of Indiegogo's desire to play a bigger part in getting its projects manufactured and distributed. Out of the Brookstone-branded box the headphones are chunky and very obviously made of plastic, with the fake speaker drivers on the ears making them look kind of cheap. But they don't feel cheap. They're pretty weighty and handled a few dings against various desks, doors and a particularly inconvenient metal pole on the subway just fine. The ear cups fit comfortably, and I was able to wear them for about five hours before I needed to take them off -- not because I was hot or sweaty, but because the inner fabric covering the drivers brushed against the tips of my ears in such a way that they started to chafe. Again, this took five hours, which is a decent run time when you consider many headsets might only have two or three hours of comfort in them. When it comes to listening to music, they're fine. Nothing spectacular; these aren't going to be giving Sennheiser a run for its money any time soon. The sound is crisp and clear, with adequate volume. The highs and mids are fine, but the headphones are a tad heavy on the bass, though. But what else would you expect given the intended audience of anime kids and ravers? I listened to David Bowie, the Guardians of the Galaxy soundtrack and the Hamilton cast recording, and everything sounded decent. However, I did occasionally find that some of the older classics lacked a little oomph, especially if they didn't embrace the low end. The ear-shaped speakers on the headband are a far different story. Hopefully your friends and neighbors don't particularly desire high-quality sound because, as befitting their size, the sound from the speakers is a bit tinny and lacking in depth. They might be adequate for a quick share, or if you just really, really want to bother strangers on the subway. With all this settled, it was time to take the show out on the streets of New York City. As noted, New Yorkers have mastered the art of not actually looking at you, making it hard to determine if these were as attention-getting as I thought. I did catch the eye of the occasional small child, and there was an older woman outside my apartment building who said, "Those are pretty cool!" Thank you, random old lady. The lights obviously stand out more at night; there's something eerie about seeing my reflection in black glass and only making out the purple circles of the ear cups and speaker ears. And it was off-putting to look at my shadow on the ground and see a distinctive cat ear shape. But it's not like I ever forgot I was wearing them, in case the omnipresent purple glow wasn't already reminding me. You see, the ears exude a subtle pressure on my head, which isn't painful but certainly noticeable. And they're not exactly aerodynamic, either: On a particularly blustery day I felt the wind hit the ears, pushing the entire headset backwards on my head. Could they be blown off in a particularly strong gust? Maybe. At least they're warm and kept my head pretty cozy -- which is good, because there was no way my hood was going to fit comfortably over them. The more I wore the cat ear headphones, the more they grew on me. I've worn them at home, in the office, on the street and now in the middle of a blizzard. They're fun to wear -- not just for people's reactions as I walk by, but also for how it makes me feel to wear something so silly and whimsical. Maybe it's all the anime I've watched over my lifetime, but it turns out that somewhere inside of me was a cat raver girl just waiting to come out.